The amorphophallus titanum has perhaps the least charming nickname of any flower: it's known as the corpse flower because it smells like rotting flesh. And yet its latest bloom this weekend is expected to bring over 10,000 eager admirers. It's a generally remarkable flower, standing well over six feet tall, and this particular one has been steadily growing more than two inches a day since it first emerged from the soil in March. Switzerland's Basel Botanical Gardens is the latest to bring the flower to bloom in captivity, the first time in 75 years the country has seen such a bloom. In fact, there have been just 134 recorded artificial blooms since the first one in 1889, making the corpse flower a relatively rare treat - if you can call the smell of rotting flesh a "treat" - for botany enthusiasts. The species is native to the tropical rainforests of Sumatra, and any attempts to make the flower bloom in captivity require precise simulation of its natural humid climate. Even then, it's rare for the plant to grow and blossom, whether it's in the wild or in a greenhouse. 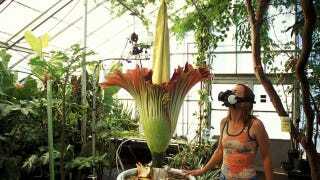 Its corpse-like odor is thought to attract certain insects for pollination purposes. Via BBC News. For more on flowers that smell like corpses, check out our earlier post here. Image via.